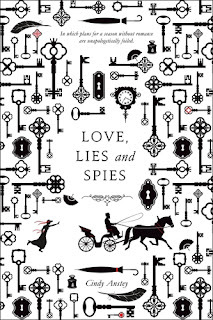 Described as an homage to Jane Austen, Love, Lies and Spies takes its nineteenth-century heroine and hero on a rollicking ride in this debut novel from author Cindy Anstey. Juliana Telford is fascinated by Coccinellidae, otherwise known as lady beetles. They are a hobby she shares with her eccentric father. An interest serious enough that Juliana wants to have their research published. It’s for that reason she agrees to have a ‘season’ in town. She has no expectation nor desire to find herself a husband, unlike her cousin, Carrie and her snooty friend Vivian. Juliana plans put her time to better use meeting with publishers, and hightail it from town as soon as possible. Before she can even make it to London, Juliana finds herself in a precarious position - literally - and crosses paths with Spencer Northam and Lord Randolph Bobbington. Spencer is actually a spy on a secret mission for the War Office. He and Juliana each believe they have found a kindred spirit, neither being inclined toward matrimony, and agree to help each other out while in London. However, things don’t quite go to plan. All is not what it seems as Spencer tries to uncover a traitor (just who is conspiring to help the French? ), and Juliana tries to untangle what he is truly up to (she keeps seeing him in various guises about town and does not understand it). Meanwhile, Bobbington appears smitten with Vivian, whose mother wants Spencer to take an interest in Vivian, and Vivian’s brother Lord Maxwell Pyebald seems to have taken a shine to Juliana. All in all Vivian and her family have become serious thorns in Juliana’s side. Chapter titles provide amusing segues between scenes, with names such as: In which a young lady clinging to a cliff will eventually accept anyone’s help; In which there is a lengthy discourse on the advantages and disadvantages of marriage; In which a sedate evening at the theatre is full of revelations; In which Uncle Leonard takes it upon himself to aid his niece in scholastic matters; and In which silver candlesticks are prevented from gadding about town. Will Juliana get published? Will Spencer catch the traitor? And just who will end up with whom? Grab a copy of the light-hearted, romantic mystery that is Love, Lies and Spies and find out.